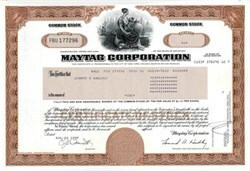 Beautifully engraved uncancelled certificate from the Maytag Corporation issued in 1997. 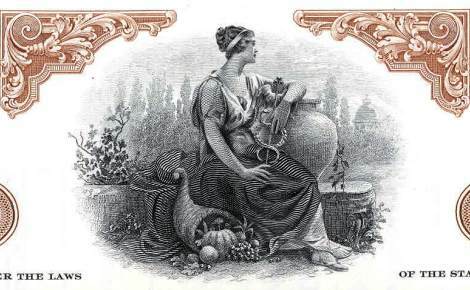 This historic document was printed by the United States Banknote Company and has an ornate border around it with a vignette of an allegorical woman, looking over a yard, sitting next to a cornacopia. This item has the printed signatures of the Company's President (Leonard A. Hadley) and Secretary (E.J. Bennett). Maytag Corporation is a leading producer of home and commercial appliances. Its products are sold to customers throughout North America and in international markets. The corporation's principal brands include Maytag, Amana, Jenn-Air, Jade, Hoover and Dixie-Narco.